We were motoring out of Cairns with no wind and glassy seas. As evening fell it was clear that the situation was not going to improve, an opinion which was backed by the GRIB data that I downloaded which did, however, intimate that things might be better on the morrow. Rather than burn fuel all night, we checked the chart for likely anchorages and settled on the Low Islets, which are really just a mangrove swamp sticking out of the sea. Naturally we arrived in full dark, to find a good sprinkling of yachts already there – including a large number of unlit tourist punts, which our Lucas cruising guide had warned us about – and found some swinging room at the back in about 12 metres of water on a sand and coral bottom. Bronwyn magically produced a full roast lamb dinner with all the trimmings. I don’t know how she does that. LOW ISLETS. PRETTY LOW, HUH? In the morning, there still wasn’t any wind, so we idled away the early morning on little chores, grumbling in a mild sort of way about a whole week of still days and dull motoring. By ten o’clock the promised trade winds arrived as a gentle breeze. We cleared up below and prepared for sea. While hoisting the anchor, we noticed a very large fish taking an inordinate amount of interest in our hull, over a metre long and very powerfully built. Even when we started to motor out of the bay, it kept station with us, and we noticed a big propeller scar just behind the dorsal fin. Perhaps it was used to being fed by tourists. And tourists there certainly were, in plentiful supply. As we left, they began to arrive in droves on large commercial sail boats of all descriptions, including an enormous cat ketch and a pseudo-oriental junk. All these people were decanted either onto the beach by the lighthouse, or into one of the many fishing punts and jet skis that littered the shore. Already far from the madding crowd, gentle winds pushed us northward. To our left, the Great Dividing Range marched impressively along the shore line, cloud-shrouded thousand-metre peaks rejoicing in such names as Mount Sorrow, Mount Surprise, and Mount Unbelievable. 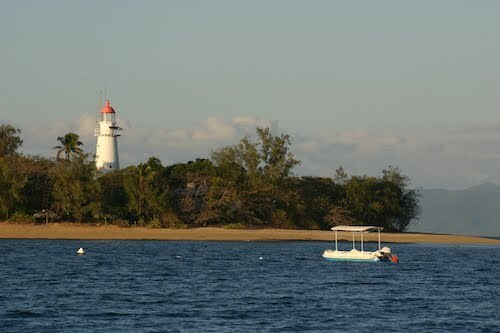 Captain Cook had a bad time along here, hence also Cape Tribulation, Struck Island, Weary Bay, plus of course Endeavour Reef where he grounded and only got off with quite serious damage which had to be repaired ashore in what later became Cooktown. MAYBE THERE’LL BE WIND TONIGHT? This entry was posted in Australia, Oceania, Travel, Voyage of Pindimara and tagged Sail on 2009/08/16 by Reinhard.